Tagged, the San Francisco-based social network that is most notable because of its ability to grow profitably during the Facebook era, has closed its first acquisition. 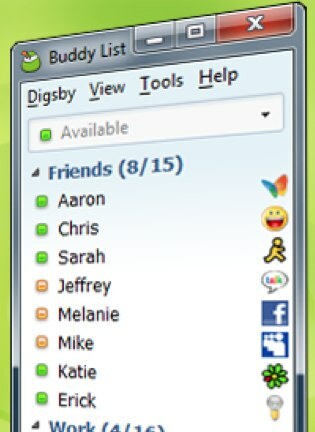 dotSyntax, the corporation that created the popular Digsby instant messaging and social client, is now part of Tagged. The terms of the deal were not disclosed, but all seven dotSyntax employees will join Tagged. Digsby has 3 million registered users today (Tagged has over 100 million), and the company has raised $500,000 in funding. If you’re unfamiliar with Digsby, there’s a good overview video here showing how the product works. It allows users to interact with social networks, webmail and instant messaging services. Websites can also integrate Digsby into their sites.